These Christmas beer labels are the perfect gift idea for your man this Christmas. It is quick and easy to prepare and you know it is going to be something he will love. For a cost effective, easy, different gift idea this definitely ticks all the box’s. Alternatively, they would look fantastic at a Christmas party or to enjoy a cool beverage on Christmas day. Either way, these cute Christmas beer labels will be sure to be a hit. Christmas is only five weeks away, it’s creeping up so fast. It’s this time of the year that the mad panic starts, with multiple trips to the shops looking for that perfect gift. I don’t know about you, but I always have 101 ideas of what to get the girls in my life, but when it comes to the men, it seems to be such a struggle. It’s like I have used up all my great ideas in the past and looking for something quirky, original and fun sometimes seems like it’s thrown into the ‘too hard basket!’. That’s where these Christmas beer labels come in handy and make the absolute perfect gift for all the blokes. If you know a guy that loves his beer, then this is the perfect way to jazz up the present and make it more personal than just handing over a standard 6 pack. This collection of cute Christmas beer labels will be sure to make your guy smile. Whether it is for your husband, boyfriend, father, brother, uncle, friend, guys are all kids at heart and I’m sure these printable beer labels will make them chuckle just a little bit. The PDF is available with all six designs, but you could just use your favorite if you wished. To accompany the beer labels, I also made up six bottle neck labels which each say “Happy Christmas”. They are color coordinated to suit the designs, but you could easily experiment with mixing up the colors. These Christmas beer labels are now available in our Etsy store for you to download immediately. Why bother rushing around the shops, when you can easily organize your gift from the comfort of your own home (and a quick trip to the off licence)! Creating these Christmas beer bottles could not be easier. Step 2: Cut out the labels. Step 3: Attach the labels to the beer bottles. I recommend using either full size sticker sheets and attaching directly onto the bottle, OR print onto matte photo paper and attach with double sided sticky tape. If you have trouble removing the original label, place in a bowl of water and you will soon find it easy to peel. Why not go one step further and make a hamper out of the gift. It’s easily done just by grabbing a basket or a box and fill it with your unique bottles. Maybe throw some nuts or chocolate in there too and make it a complete hamper. This would make a wonderful Christmas gift which is 100% easy to achieve. If he likes his cookies, you could always throw in some cookies in a jar using free printable food tags. What is it they say? “The way to a man’s heart is through his stomach!”. So forget chasing around the shops this year looking for that perfect gift for the guys. 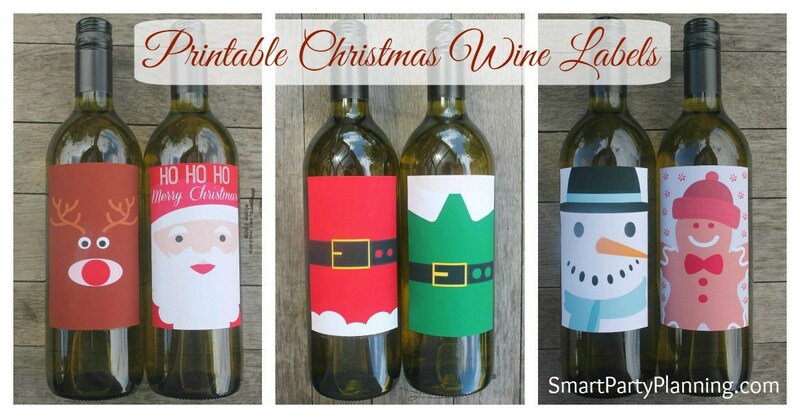 Instead why don’t you pour yourself a glass of wine, use the printable beer labels and start creating the Christmas gift that your guy is going to love. If you would like to gift this Christmas beer labels collection, you can obtain the PDF file directly from our Etsy shop, then hey presto…your gift is complete. 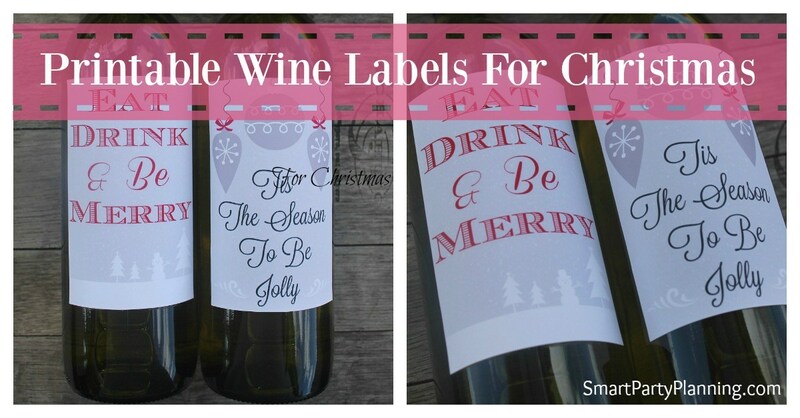 Matching Christmas Wine Labels – These labels match the Christmas beer labels perfectly, so they are perfect to gain as a set. 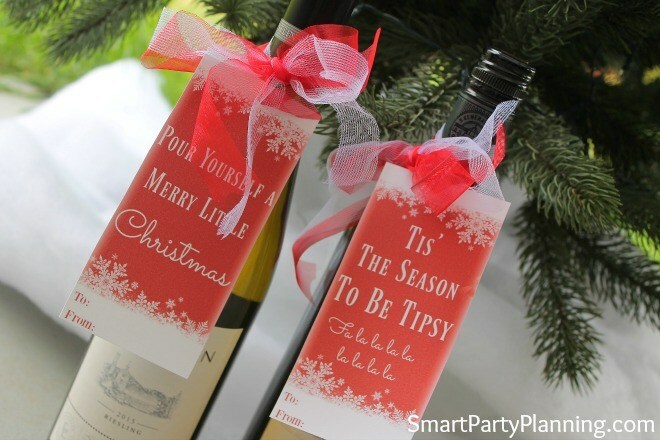 Wine Bottle Tags – Super fun and festive, these tags attach to the bottle of wine with a gorgeous festive ribbon. Christmas Wine Labels – For some labels that look a bit more sophisticated, these Christmas wine labels are perfect.